The Nidec Elesys Millimeter Wave Radar operates by emitting a 76 GHz radio signal in a predefined direction through a transmitter. The waves reflected by objects located within the radar's detection range are then received back by a receiver module and processed to determine the distance and relative speed of those objects. 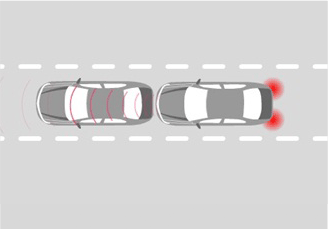 This information can then be used to maintain safe distance or stop if necessary to avoid collision. 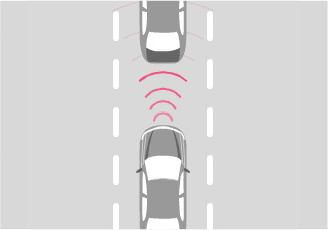 The Adaptive Cruise Control system, or ACC, is based on our proprietary 76GHz radar technology. The radar detects objects in its path and monitors both the distance and speed of the vehicle in front. 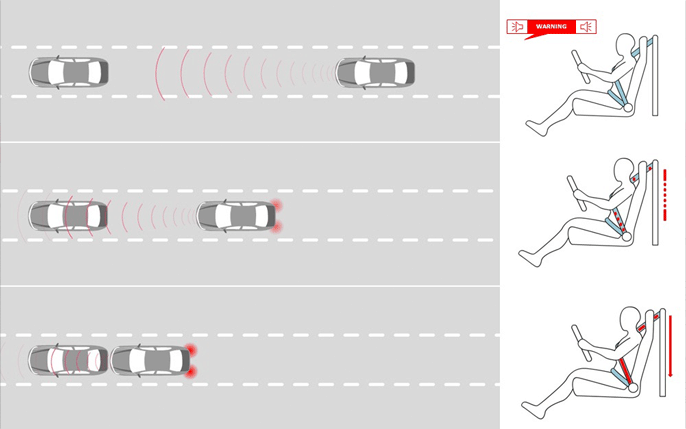 By tracking a preceding vehicle, the ACC system provides automatic acceleration and deceleration to maintain a desired or safe distance. This in turn provides the driver with a safer, more comfortable, and stress free driving experience. The Nidec Elesys Collision Mitigation and Braking System (CMBS) works in conjunction with ACC to provide full braking in emergency situations. 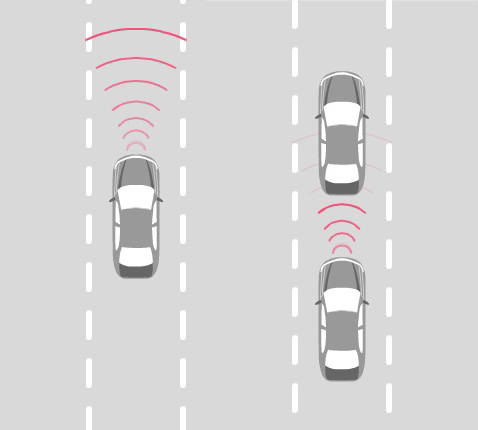 Like Adaptive Cruise Control, CMBS utilizes the radar to monitor the lane in front of the driver. CMBS differs from ACC in its integration with other Nidec Elesys technologies such as Anti-lock / Stability Control systems and E-Pretensioner control units. If the radar detects an object or vehicle in its path, the CMBS will first alert the driver through an audio and visual warning. Next, it will apply moderate braking to slow the vehicle and engage the E-Prensioner to "tug" the seat belt to notify the driver. Then, if needed, it will engage stronger braking power to avoid or mitigate the effects of a collision. CMBS also works in cases where another car suddenly enters the lane in front of the vehicle, or if the preceding vehicle stops suddenly. CMBS will apply braking faster than the driver would on his or her own. 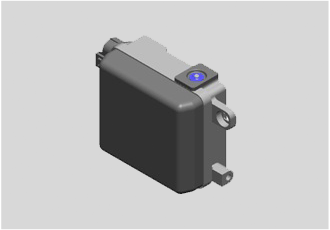 If the system determines a collision inevitable, the E-Pretensioner tightens the seat belt to further protect the driver. We are committed to developing the world's highest quality automotive safety systems. Our innovative products, like adaptive cruise control and the vehicle stability assist, make drivers and vehicles safer than ever before. We not only create electronic systems that keep the world's drivers moving. We engineer peace of mind. NIDEC ELESYS AMERICAS CORPORATION . © 2019 Nidec Elesys Americas Corp.